A&B Hostel Principe Pio, Madryt, Hiszpania : Rezerwuj teraz! 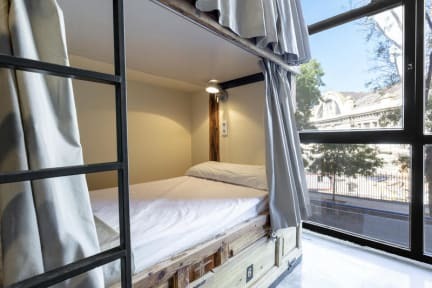 The brand new A&B Hostel Principe Pío is the new option to stay in Madrid city center. We have a vast experience in the hospitality sector as well as a vast knowledge about the city, elements that we do capitalize to bring a great experience to our guests and travellers within our facilities. We are located near from everything Cool Madrid has to offer like The Gran Via, Sol Square, Royal Palace and walk distance from trendy neighborhoods like Malasaña or Chueca. In addition, other many attractions and landmarks of the city are near to our facilities, so it is piece of cake to explore and discover them. 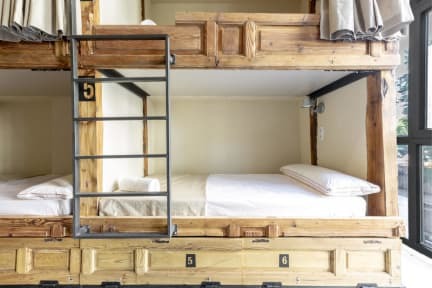 Each shared room has bunk beds with curtains for privacy, and individual lamp and 2 plugs connect your devices, Every room has blackout curtains, some rooms have shared bathrooms inside. All rooms have free wifi.